Sometimes you don't have to leave your street in seek of adventures; or at least when you're a girl who works at a ramen shop with her mother and has a funny "quality" to explode (I mean emotionally) pretty quickly! Miki (obviously) got it from her mother, who beats her in front of their customers when she messes up and then blames her for scaring them away! Poor Miki gained a lot, and I mean a lot of rivals using this "quality": the next door bakery owner who intends to really kill her one day, a strange childhood aquantice whom she doesn't remember of, but he remembers her and wants to chalenge her for a remach (because she beat him up when she was little, altough he was a though-looking scary guy who was older than her), a ghostly teacher of a nerby school who wants to kill herself because her students are afraid of her because she looks ghostly, a dog that blew her ramen delivery and she wants to take revenge on him (added to that, the dog's the only one aside her mother who can be compared to her by strength), and a couple of people who don't want to kll her: a girl who owns the dog and has misunderstood the tough guy's feelings for her, thinking he loves her instead that he wants revenge, and the poor looser next door who works with her mother and aranges fresh vegetables that they use for fixing ramen. Pretty adventurous, huh? Putting that aside, Miki has also got a very caring personality, ocasinally (or better said, always) stopping by and putting aside her very important delivery to help lost kittens and children (and even ghostly teachers, when necesary). She also appears to feel very sorry for the vegetable-man who has this obssesion for an anime show Star Rengers and ocasionally gets carried away, and all of her oponients who can't reach her level of... violence? If you are a fan of School Rumble and Hare+Guu, you will love this Anime. It was funny and unpredictable. I should say silly in a way. The few last eps bored me a little but I bet everyone will enjoy it. The relationship of each character is so unique and Miki, the ramen girl is unbeatable. Good ole fashion crazy LMAO!!! I truly enjoyed this one for is simple joy of making me laughing!!! The Miki is the epitome of a classic kick A chick. She's tough, considering how she is with her mom. She wins against everyone with the one exception of her mother. I have not had a good laugh in a long time. I advise everyone to see this and just laugh!!!! They say that Laughter is the best solution to all your problems. This anime is supposed to be of the gag variety, so I didn't expect much in terms of story. But it just wasn't funny in the end. Essentially, every episode is the same, even the jokes are the same. You chuckle at them the first time around, but it gets old fast. The characters don't help either. I found myself despising the main character, and I don't think I'm supposed to. This is an anime full of action and comedy. A series that won't get you bored at all. Innocent but still aggressive with the classic values among a community reinforced every chapter. I enjoyed so much this series, and I bet you can enjoy it too. About the title, it may be translated in a better way I think, but still, the series is great! 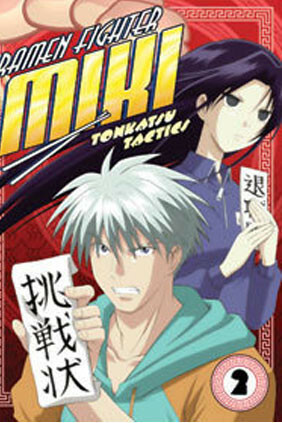 Ramen Fighter Miki is a relatively unknown comic series. And what a series it is. Miki, the protagonist, is a stupid, violent, ramen delivery girl who constantly puts herself in unique and zany situations. The music and animation, while not top grade, sufficiently help tell the story There is no fan service, angst, or drama.The show strictly revolves around making its audience laugh. And it does a great job at that. If you enjoy shows like Beezlebub then you will most likely love Ramen Fighter Miki. A refreshing change of pace! This anime is great, everyone should watch it. It follows Miki as she goes about her daily life working at her family’s ramen shop. Boring? NO, not at all, this show is hilarious! It seems like she’s always getting into a fight with someone. The character’s personalities, while admittedly generic, are remarkably funny (It’s definitely part of this shows charm). My favorite thing about this anime is there is no commitment. You can stop and pick it back up when you need a good laugh (because we all know these current titles can get really intense).So if you need a refreshing break from all the new anime, check this out!!!! Poor Doufus the Punching Bag. Enjoyable, not super quality production, and far to uninspiring to be much more than filling on your list of shows to watch.